Queenslanders love a touch of luxe, but as Serge Nagra realised while renovating his Yeronga home, design aficionados without a millionaire’s budget have their work cut out finding high quality, luxurious finishes. Topping his list of décor pain points were the functional ‘boring’ details—like light switches and power points— and high-end ‘feature’ products like wall coverings. Chatting to a fellow MAMIL (Middle Aged Man In Lycra) over a post-ride coffee one weekend, Serge realised he wasn’t the only one annoyed by the limited options for finishes that didn’t break the bank. His friend, also a recent renovator, agreed that the only available options for switches and wall features he’d found were either terribly cheap looking or priced well out of the range of the average home owner. Twelve-months and several trips to overseas manufacturers later, Serge left his corporate job and Brisbane gave birth to yet another entrepreneurial venture – the aptly named Bella Lujo (a multi-lingual mix of Italian and Spanish, meaning beautiful luxury). Serge has developed something to satisfy both the heads and the hearts of design lovers including their range Luminosa and Renaza. “Luminosa is Australia’s first glass light switch range and is an affordable way to add a luxurious finishing touch to a room, or a whole house,” Serge says. “While Renaza is a range of mosaic timber tiles, made from sustainably sourced, 100-year-old recycled timber, re-purposed from decommissioned boats. So we have the uber modern contrasted with a reclaimed, vintage vibe. “Brisbane design is getting edgier all the time and we love Bella Lujo being part of that evolution. 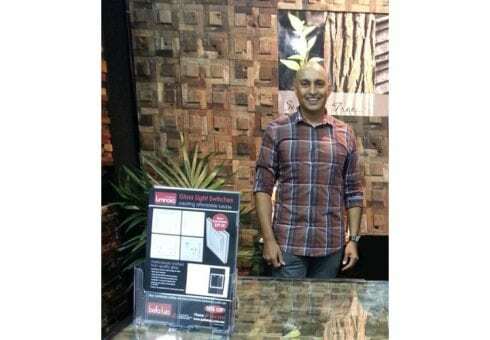 To scratch that itch, Serge says some of Bella Lujo’s new products are “pretty insane”, including wooden, stone or grass wall paper. 1. Isolate one or two key details – for example handles on cabinets or doors, light fittings or light switches or powerpoints and lavish extra attention on them. Your home should have a ‘well thought-out feel’ which includes caring about the finer details. 2. Research – these days you can hunt down trends and save by shopping online when renovating. If you make a decision to save on things that aren’t that important to you, you can lavish those funds on the little details most other people overlook. 3. Be daring – when you’ve chosen one or two details to focus on—be it a feature wall or cabinet handles—you can afford to be more avant garde. So while you might not want red on every wall of the house, a pop of colour in the form of a light switch can really ramp up the wow factor. ← Switched on makers of affordable luxury, launch Australia’s first glass light switch range.